Adopted on October 10, 1975. By Act no. 1183 on October 10, 1975, the largemouth bass, (Micropterus salmoides,) was chosen as the state freshwater fish. 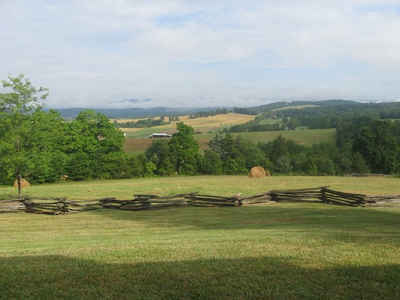 The Legislature erred, however in the wording of the legislation. In Act No. 1183, 1975 when they designated the Largemouth Bass as the official state freshwater fish, they incorrectly identified it by the Latin name Micropterus punctulatus, which is actually the Spotted Bass. Largemouth Bass is abundant in Alabama inland waters and popular with sport fishermen. It can be found throughout the United States in ponds, lakes, and rivers. 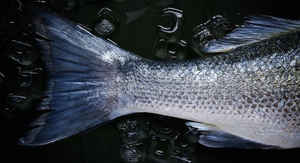 Micropterus is Greek, meaning "small fin." Salmoides is from the Greek salmo, meaning "trout", and refers to the fact that largemouth bass have been called "trout" in some southern states. They are sexually mature at just over 2 years of age (52cm in length). Largemouth bass have a black to green back with lighter sides and a pale belly. They have a dark wavy band running the length of their sides. Their mouth extends beyond their eyes. Most have a black non-defined line running laterally along their body, but in some individuals the line becomes more like a series of blotches. The fins and tail are generally pale brown. Male Largemouth bass are usually more slender and darker in color than females. Body green-shaded with a broad, continuous dark stripe along each side; belly white to yellowish; dorsal fin almost completely separated between spiny and soft portion and lower jaw extends past the gold-colored eye; commonly reach lengths up to 16 inches by three years of age. 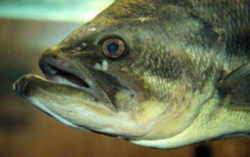 Largemouth bass are native to North America. They can be found at St. Lawrence, Great Lakes, Hudson Bay (Red River), and Mississippi River Basins, the Atlantic drainages from North Carolina to Florida and to northern Mexico. The species has been widely introduced as a game fish and is now cosmopolitan. Largemouth bass are freshwater fish and generally inhabit clear, vegetated lakes, ponds and swamps. They prefer quiet, clear water and often hide in dense vegetation along the edges of a water body. They preferred temperature is 68-78 °F. Largemouth bass have a voracious appetite. Adults feed on fishes, crayfish and frogs, while juveniles feed on crustaceans, insects and small fishes. These fish can become cannibalistic. They do not eat during spawning or when the water temperature is below 5 degrees or above 37 degrees. Largemouth bass grow up to 97cm and 10kg and can live as long as 11 years. The law designating the largemouth bass as the official Alabama state fresh water fish is Section 1-2-9 (State fresh water fish ) of Chapter 2 (State Symbols and Honors) of Title 1 of the Code of Alabama, 1975. Chapter 2 - STATE SYMBOLS AND HONORS. The largemouth bass, Micropterus punctulatus, is hereby designated and named the official fresh water fish of Alabama. The largemouth bass is incorrectly designated as Micropterus punctulatus in the legislation. 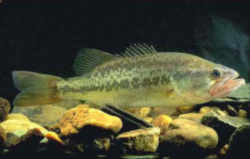 Micropterus punctulatus identifies the spotted bass, not the largemouth bass.